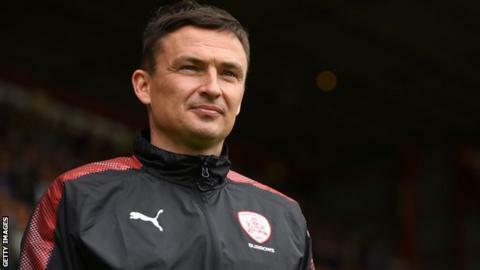 Barnsley boss Paul Heckingbottom is expected to be appointed as the manager of Championship rivals Leeds United within the next 24 hours. Providing there is no issue with his contract, the 40-year-old will be named as the replacement for Thomas Christiansen. Dane Christiansen, 44, was sacked after just eight months in charge of the Whites on Sunday. Heckingbottom agreed a new rolling contract at Oakwell last week. The former Darlington, Bradford and Barnsley defender has been in charge of the Tykes since February 2016, initially on a caretaker basis. He guided Barnsley to promotion to the Championship via the League One play-offs and victory in the Johnstone's Paint Trophy before being appointed as head coach in June 2016. Leeds are 10th in the Championship, having failed to win since Boxing Day and dismissed Christiansen following their 4-1 home defeat by Cardiff on Saturday. The Elland Road side, who are seven points off the play-off places, selected Heckingbottom from a shortlist of three candidates.